We'll start today's random meal round-up with this gorgeous bowl of ravioli! These are the Rising Moon Organics Butternut Squash Ravioli with Artichoke Alfredo (by Victoria Vegan). It tasted as delicious as it looked. Here's a popsicle from MEMPopS, the paleta shop in Crosstown Concourse. MEMPopS seriously makes the best popsicles earth, and this new flavor — Tres Limon — is my new fave. It's mint lemonade, strawberry lemonade, and hibiscus lemonade all in one! I had this on Saturday after an 18-mile training run. Hit the spot. I met up with a former Memphis Flyer staffer (the newspaper where I used to work) for lunch last Friday at Midtown Crossing Grill. I got the Hummus Flatbread, which I often get intense cravings for. 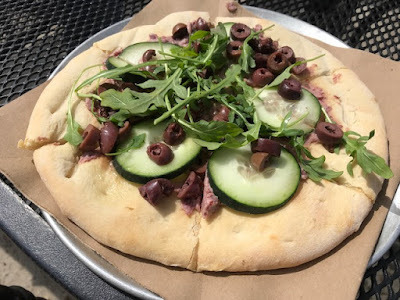 This has hummus, kalamata olives, olive oil, and cucumber. I even like the arugula on this, and I kinda hate arugula. One day last week, I was so busy that I couldn't leave work for lunch, so I grabbed an Asia Bowl with sesame-coated tofu, Asian slaw, and quinoa from Mama Gaia in Crosstown Concourse. Got a side of Hummus & Veggies. It's so awesome working in a place with so many vegan options (with even more coming soon!). Here's a terrible photo of a weird but tasty brinner from Saturday night. Leftover Curried Cauliflower Frittata, Veggie Sausage, Potato Pancake with Ketchup, Sauteed Cabbage, and Toast with Vegemite. I made the potato pancake using leftover colcannon from St. Patrick's Day. Thursday night was our bi-weekly girls night at my friend Shara's house. She always drinks Crystal Light with vodka, which never sounded good to me. But she convinced me to try it last week. She uses the stevia-sweetened Crystal Light, so it's a little more natural than the regular kind. And you know what? It works! It's pretty good! Brinner. I love it. My sister and I used to call our 3 pm meals Dinch. I seriously need that popsicle in my life. Anything lemon I'm all in!! I definitely need that popsicle in my life too! The crystal light drink sounds really good too. I didn't know they make it with stevia, I'll have to check that out. A hummus flatbread sounds amazing and totally up my alley. The ravioli looks beautiful too! Ha! I’ve actually had crystal light and vodka! Well, many years ago now but it was always good-even better with some fresh lime or lemon. I used to drink waaaay too much crystal light and had to just kick it cold turkey. That sesame tofu looks amazing, i bought a large package of toasted sesame seeds at the korean grocery store so i am putting loads of them on everything lately! The ravioli looks amazing, and that popsicle sounds like the most refreshing thing ever.